Wiegmann, Arend Fridericus Augustus. 1834. 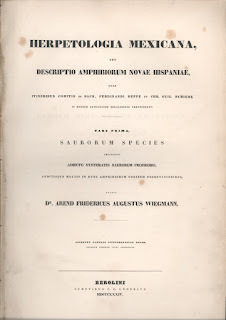 Herpetologia Mexicana, seu descriptio amphibiorum Novae Hispaniae. C. G. Lüderitz, Berolini, vi, 54, 10 plates. 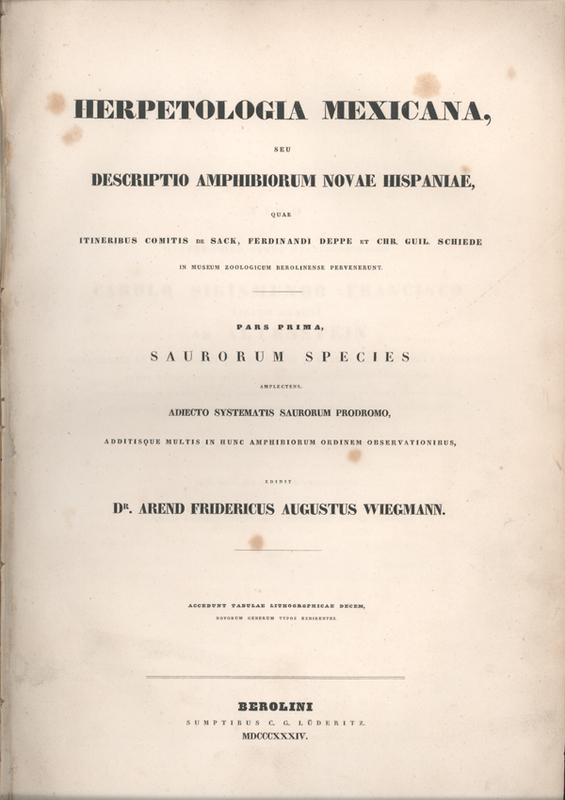 The second part of the book consists of Weigmann’s taxonomic treatment of the lizards and crocodiles of Mexico. Included are the descriptions of 32 new species of lizards, some of which had been briefly described earlier in Oken’s Isis. Descriptions of seven new genera are also given, including Heloderma. All of the descriptions are based on specimens collected by Ferdinand Deppe and Count von Sack in the 1820s. In 1969 the Society for the Study of Amphibians and Reptiles reprinted this work in a smaller format with black and white plates and an introduction by Edward H. Taylor — from which the information above can be found along with additional information about the collection and Wiegmann. This book is one of the most difficult herpetological books to be found today with very few copies coming on the retail market in the last 60 years. In addition to it’s scarcity, This large folio (12.5’ x 18.75’ or 31.75 cm x 47.5 cm) book is especially appealing because of its taxonomic importance and the ten beautifully hand-colored lithograph plates. This book is available for sale at http://www.biblio.com/bookstore/breck-bartholomew-natural-history-books-salt-lake-city/amphibians-reptiles/36862167 - If it is not listed it has been sold. Joan François Obbes (1869-1963) a well-known artist from the Netherlands, worked for a time at the Amsterdam Zoological Museum. 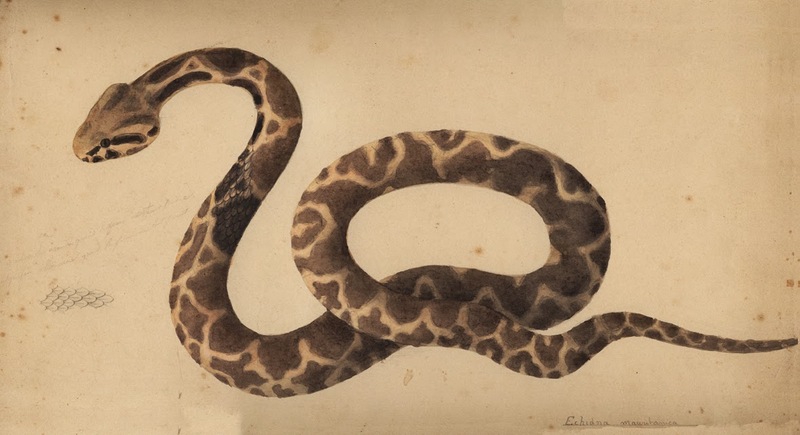 While at the museum Obbes drew illustrations for two important books, The Reptiles of the Indo-Australian Archipelago and the first ten volumes of The Fishes of the Indo-Australian Archipelago. 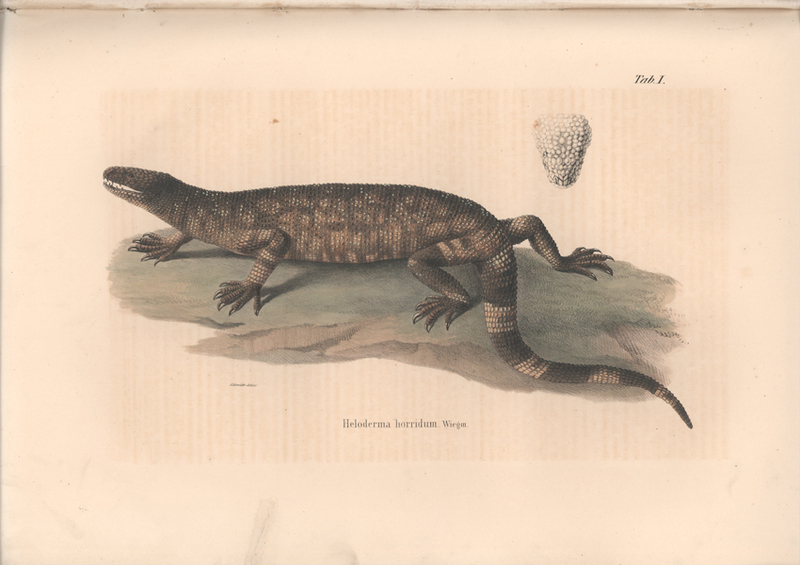 The reptile volumes contain 132 illustrations in volume 1, and 117 illustrations in volume 2. During this same time Obbes drew illustrations for the Fish volume. I am fortunate to have two watercolors, representing drawings of snakes in volume two of the Reptiles. These both hold some interest and offer some clues to perhaps how Obbes worked. 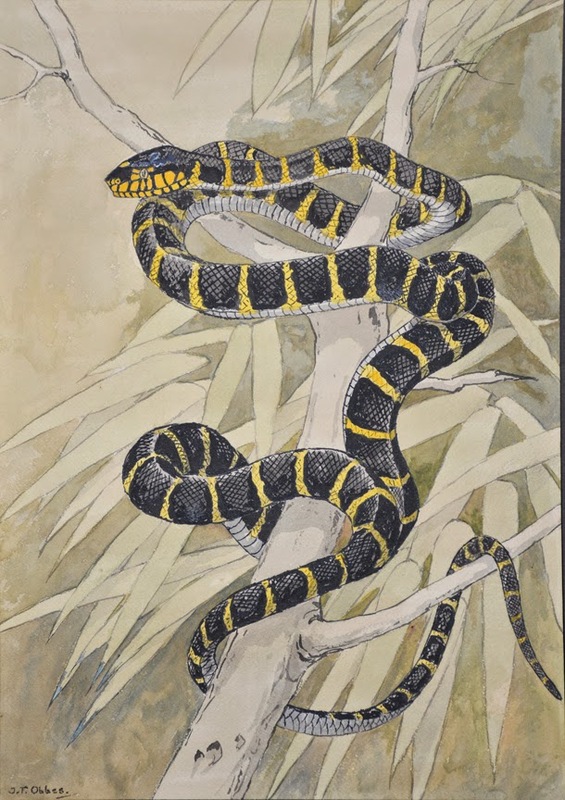 The first watercolor is of a Boiga dendrophila (Mangrove Snake). 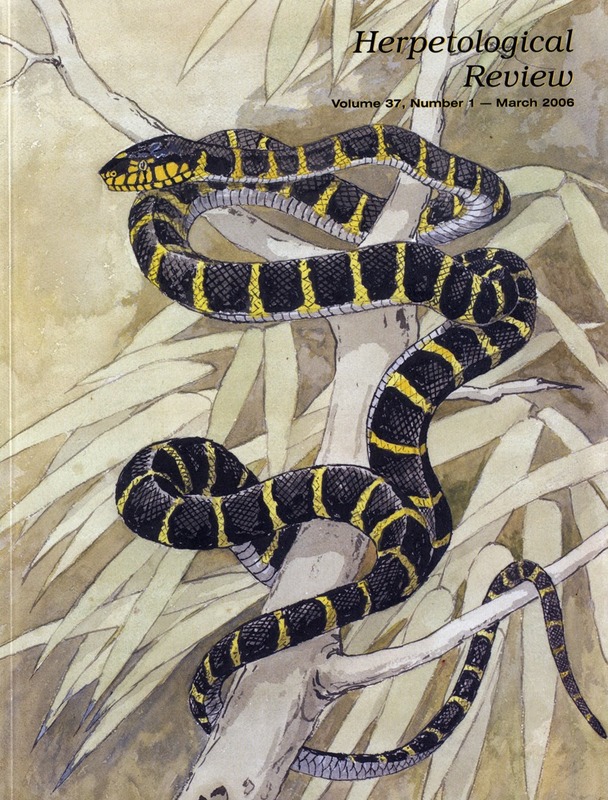 This painting was used as the cover of Herpetological Review in 2006, volume 37(1). Most of the information I have about the artist comes from the write up about the cover in this issue by Kraig Adler. Below are pictures of the original watercolor, the cover of Herpetological Review 37(1), and the drawing on page 198, of Nelly de Rooij's 1917, Reptiles of the Indo-Australian Archipelago volume 2. In this case the original watercolor and the drawing differ little. Details that are lacking in the watercolor have been added to the drawing, but this is not unusual. 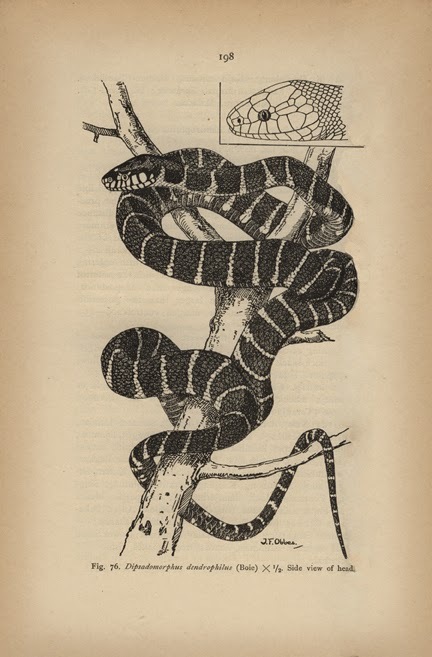 Adler (in Herpetological Review 37(1)) states, "With reference to Obbes' work, it has not been previously recorded that at least some of his line drawings used in the de Roij volumes, including the figure [of the Mangrove Snake], were based on watercolors likely prepared using live specimens shipped to him from Java. In this case, the original watercolor measures 29 x 41 cm." In my opinion the body shape and tail work much better as a Blood Python than as a Reticulated Python. It is difficult to surmise the process of illustration here. 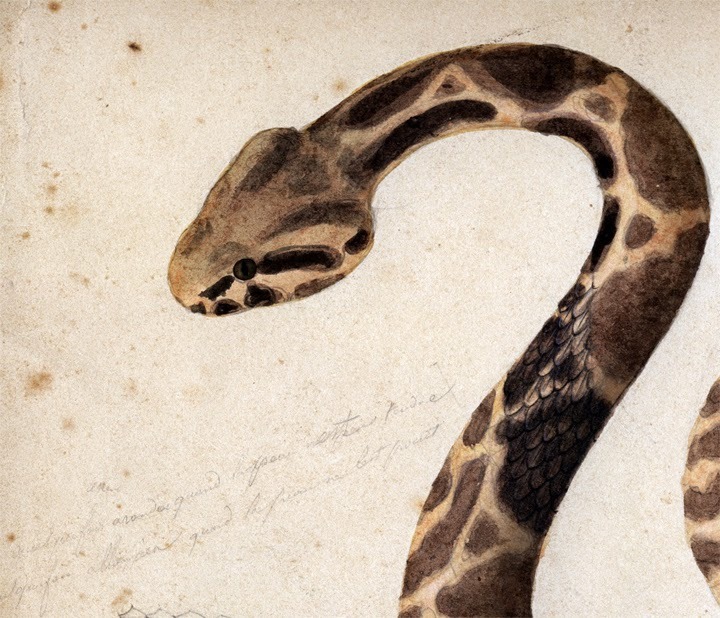 Clearly the Reticulated Python pattern is correct, as are the colors - suggesting the snake was drawn from life. 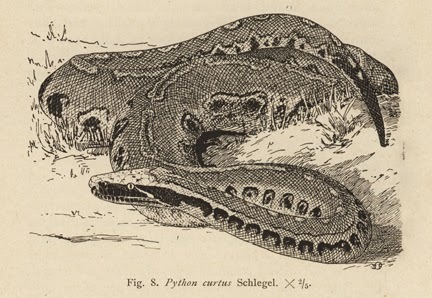 The pattern of the Blood Python is also accurate, and the body shape seems accurate, which might necessarily had to have been drawn from life, since a preserved specimen's shape may be difficult to accurately depict. Perhaps most curious, is that the book offers a proportion to life of "X 2/5". The head length in the printed drawing is 25 mm, giving a life size head length of 62.5 mm (about 2.5 inches). This is a reasonable length for a Blood Python, but not for anything, but a very young Reticulated Python. This leaves me wondering about the original watercolor, and the relationship between the two illustrations. A search for information about Joan François Obbes didm not yield much written information. I did find references to a couple of books containing information about him. Both are encyclopedias of Netherlands artists. I also found several of his watercolors have been sold, particularly through auction. Many of these are of birds, while others are of people. 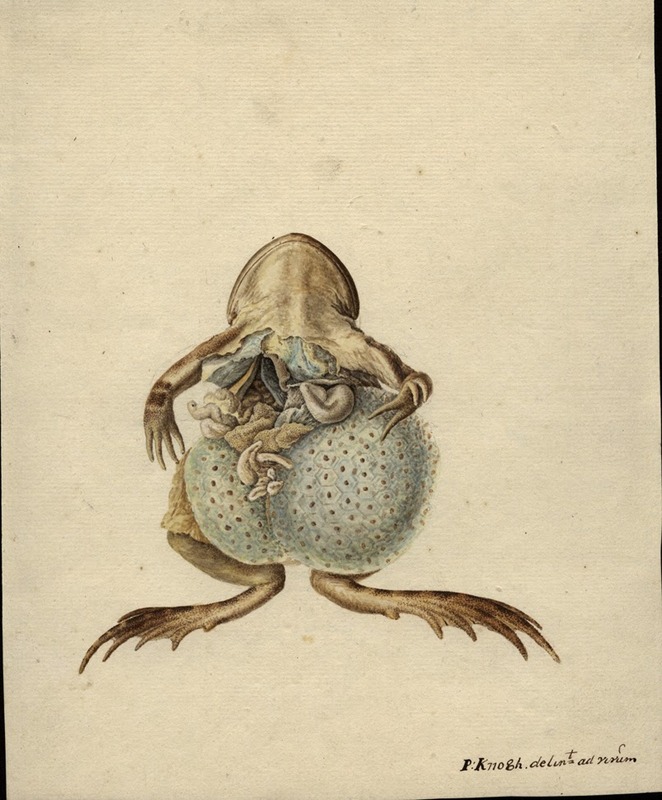 I could not find any other herpetological watercolors, although undoubtedly more exist. 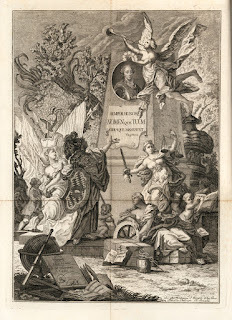 Antoine Jean Baptist Vaillant was an artist at thé Museum d'Histoire Naturelle in Paris. He illustrated numerus zoological works. 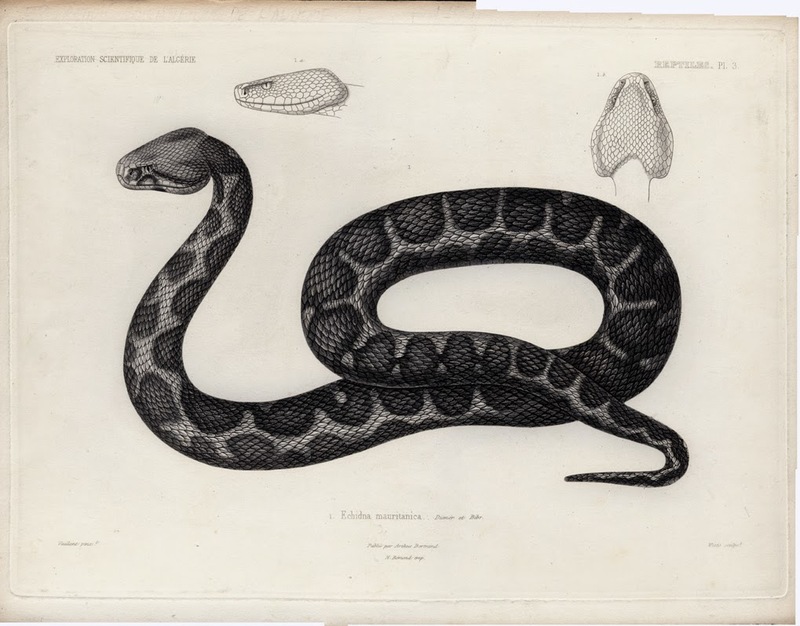 Among the herpetological works he illustrated were the turtles and crocodiles in Auguste Dumeril's (1852-1856) Description des Reptiles nouveaux ou imparfaitement connus de la collection du Museum d'Histoire Naturelle and Alphonse Guichenot (1850) Reptiles et poissons. Exploration scientifique de l'Algérie pendant les années 1840-1842. 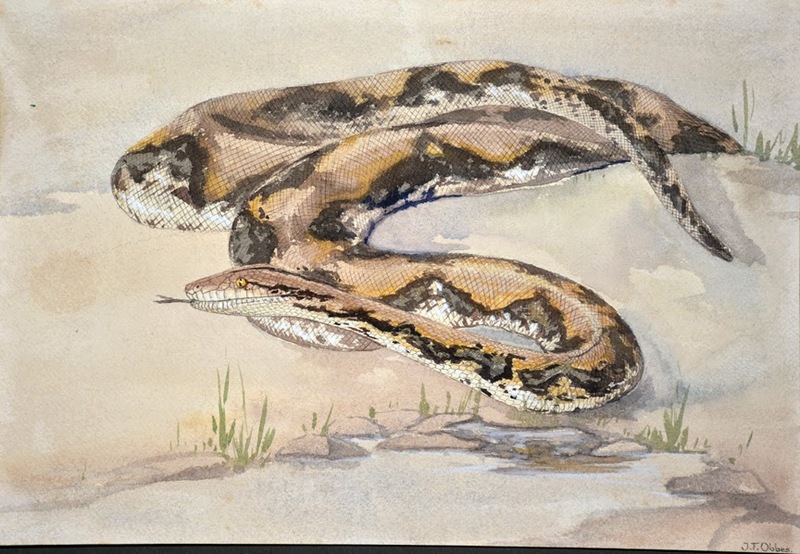 This original water color is of Daboia mauritanica (Dumeril & Bibron, 1848) is from Guichenot's Algeria work. It is interesting to note the overall lack of detail in this watercolor. 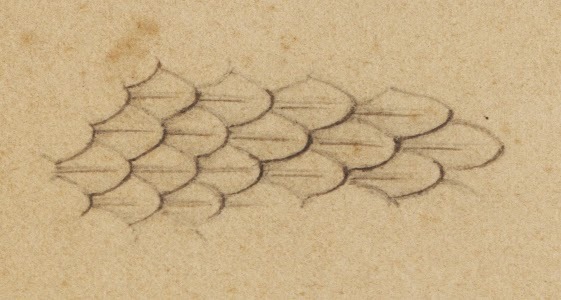 There is a small section of the neck with scales drawn in and a small section of just the scale detail separate from the snake. I didn't scan the back of this watercolor, but it has several pencil sketches, mostly of mollusks. The final (published) version of this plate in Guichenot is also illustrated here. You can see the much greater detail with the entire body covered with scales. There are also two illustrations of the head which were not included on the watercolor, but were presumably drawn elsewhere. It would be interesting to know how much Vaillant oversaw the engraving. This plate includes credit to Visto sculps (the engraver), this was J. P. Visto (Vistau) and N. Remond imp. (the printer). 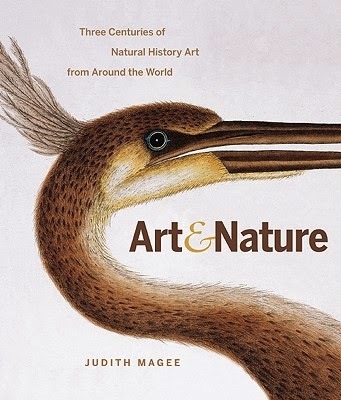 After reading Art and Nature I started thinking about the original art that I have - I don't have many. I may as well try to post the few that I do have. The oldest original art that I have are two watercolors by Paulus Knogh (1737-1802). Knogh was a Dutch mathematician and physician who was also an artist and art collector. As an artist he specialized in drawing insects and amphibians. The Rijksmuseum in Amsterdam has a few of his insect watercolors on their website. To me these paintings are very reminiscent of Maria Sibylla Merian (1647-1717). As can be seen by his work on the Rijkmuseum website, Knogh was certainly aware of Merian's work. 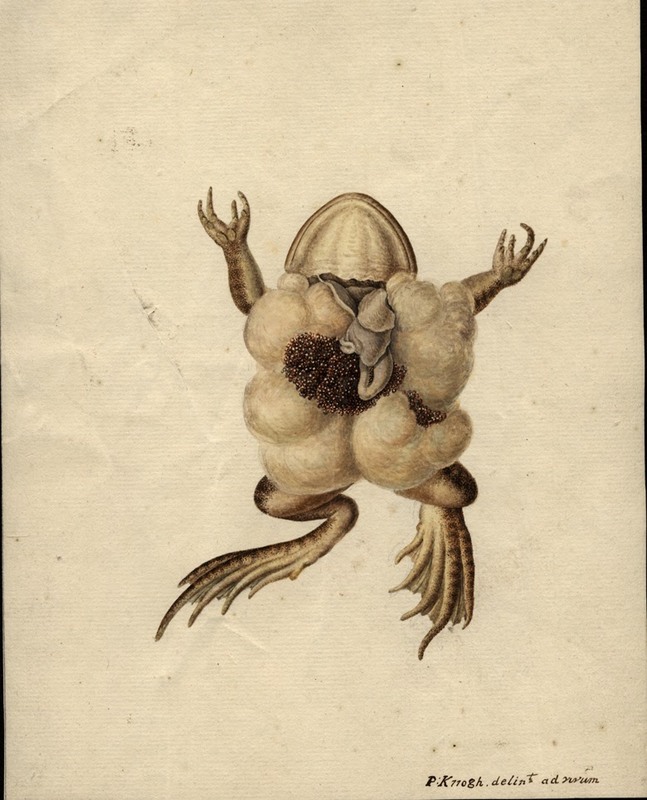 Another artist who was heavily influenced by Merian was August Johan Roesel von Rosenhof (1705-1759). His first book was on insects - Today he is often considered one of the fathers of German Entomology. His second book was on frogs and is still considered to have among the best illustrations of frogs ever produced. Here is one of the illustrations from Rosel von Rosenhof's book. It appears to me that Knogh also knew of this work (I plan to discuss both Merian and Roesel von Rosenhof in future postings). In these pictures you can see the Knogh paintings seem more realistic and finely painted than the Roesel von Rosenhof - but keep in mind the Knogh are original watercolors and the Roesel von Rosenhof is a hand-colored engraving from his book. WorldCat lists two books published by Knogh. One of them, published in 1803, Museum Knoghianum continens Praeparata anatomica ... Kabinet van naturalien has a title that suggests these painting may have been completed as part of this book. Unfortunately I am unable to locate a copy of this book or even a complete citation to indicate if it has any plates. 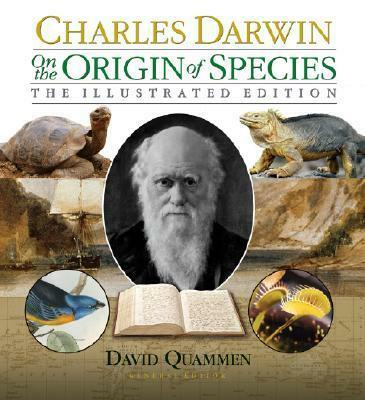 Over the past couple of months I happen to read two books about Darwin: The first was Darwin's Ghosts by Rebecca Stott and the second was The Reluctant Mr. Darwin by David Quammen. Both of these books have inspired me in different ways. I have already begun to act on my inspiration from Darwin's Ghosts, but having just finished The Reluctant Mr. Darwin today I'll have to see if my motivation results in action. 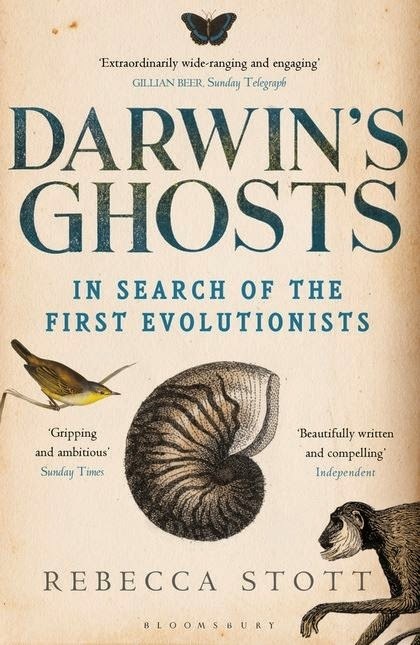 In Darwin's Ghosts, Rebecca Stott tells the story of many of Darwin's predecessors who touched on different ideas of evolution—From Aristotle to Wallace and many individuals in-between. With the exception of Wallace, no one else proposed anything like natural selection. Many of the people discussed in the book didn't really propose much of a mechanism for evolution, or transmutation, but they did propose that species evolved or changed—that is they were not created. Some of them even went so far as to suggest that all species developed from a single common ancestor. What made this book inspiring for me was that Stott, placed each person in context of the social and political environment in which they lived. Each of them in their own way was a revolutionary, at least in their thinking. For some, to suggest that species changed, as opposed to have been created by a higher power, was extraordinarily risky. But beyond that, to develop their ideas, based on their observations and what they had read, placed them as intellectuals and free-thinkers. They were definitely coming up with new ideas that were very radical, given the culture they lived in. It makes you think, what are the unsaid cultural assumptions that limit our thinking today. It is nice to assume that we live in an environment of free thought, that allows for everyone's ideas, but I am not sure that is true. Occasionally we still hear stories of peer-review papers that are rejected and highly criticized, only to receive a Nobel prize later on. The same is true for works of fiction that are rejected multiple times, only to become best sellers once they finally get published. I have strayed a bit from how this inspired me. I already knew about of many of the scientists discussed in the book, but I hadn't thought of them in the context of their everyday lives before. Some of them were involved in explorations or published books that included beautiful natural history illustrations. I have been interested in natural history illustration for a long time, but not just in the illustrations as art, or even the illustrations as a means of communicating scientific information. Some of what interests me with scientific illustration is the evolution of illustration—from simple wood blocks to metal engravings, then to wood engravings, then lithography, etc. Along with changes in the medium used for illustration, techniques were developed in older mediums to replicate the benefits of other mediums. For example, wood engravings took some techniques from metal engravings, and stippled metal engravings developed from aspects of lithography. Furthermore, I am interested in the illustrators themselves. 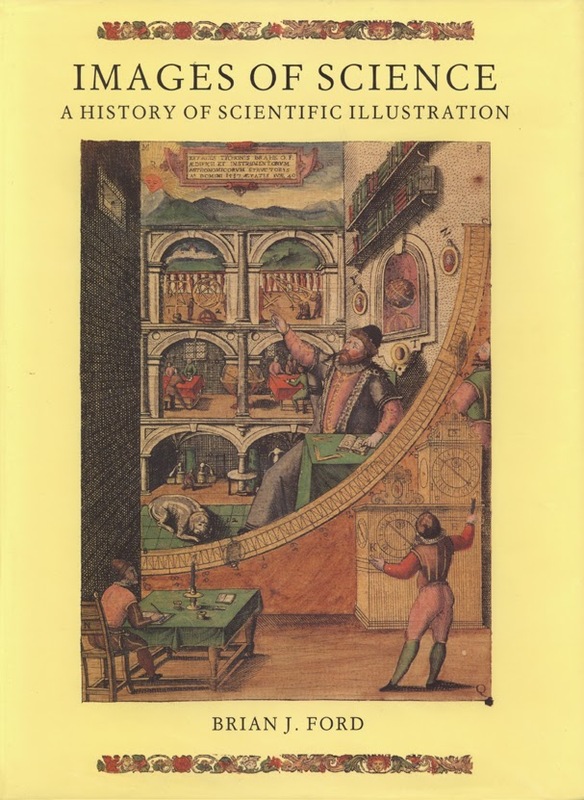 Some scientists illustrated their own works, but many books that are renowned for their illustrations, were illustrated by little known illustrators. Take for example, Louis Agassiz. His publications frequently include outstanding illustrations. It is common to read about how Agassiz couldn't find an illustrator that he was satisfied with in the USA, so he brought Antoine Sonrel to the USA as his personal illustrator. Beyond this tidbit of information, little has been published about Antoine Sonrel—He deserves more. 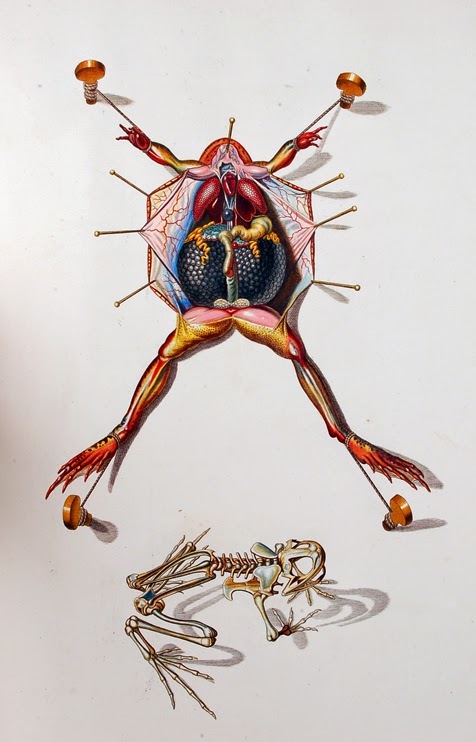 Sonrel is just one example, since most scientists have not illustrated their own works, there are many many more illustrators that are virtually unknown today. Their work as artists is overshadowed by the science they illustrated. But you have to ask, what would the science have been without their illustrations? David Quammen's book, The Reluctant Mr. Darwin, has the same general approach as Stott's book, in that Quammen places Darwin in his cultural context to discuss why it took twenty years and the threat of loosing priority to Wallace for Darwin to publish On the Origin of Species. It is an enjoyable read and covers some of the same people and topics that Stott's book does, but from a different angle and at times with a considerably different perspective. 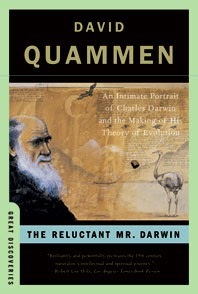 As true title suggests Quammen's book is much more Darwin focused. The inspiration I found in Quammen's book stems from one short section, perhaps one sentence. 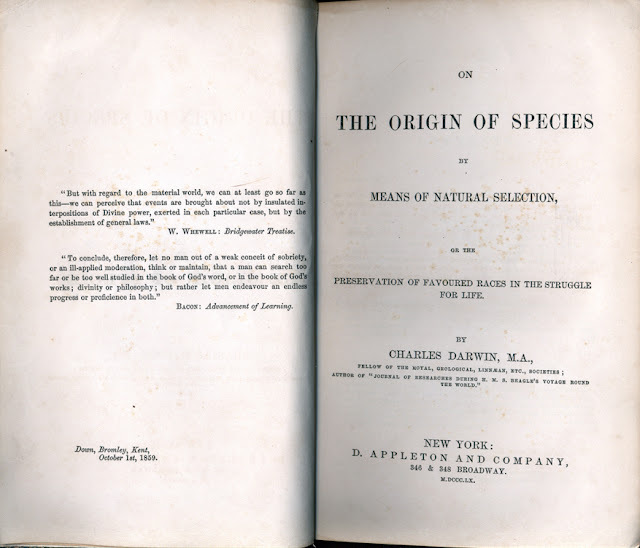 At one point Quammen mentions the overriding importance of On the Origin of Species, but then adds that it is odd that relatively few biologists, or even evolutionary biologists have actually read the book. This struck me, as I must confess, I am guilty. I have a couple of copies of the book and it has been on my "to read" shelf for years. I just never seem to get around to it. Now that these two books have set the stage, putting evolutionary ideas and Darwin himself in cultural context, I think it is high time I read On the Origin of Species. Without having begun, I would recommend reading Both Stott's book and Quammen's book, perhaps before reading Darwin's book. Part of my fear in reading Darwin has been that I know there are some portions of the book that are known not to apply and I haven't wanted to be disappointed in the book as a whole. I think now that Darwin's Ghosts and The Reluctant Mr. Darwin have prepared me for these portions, by adding a context for me to interpret them, I won't be disappointed at all. In fact, I may be even more impressed with the work, knowing more about it's history and the scientific and social environment in which it was published.